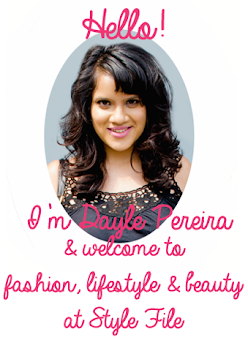 My love for DIY projects is one that needs no proof as an entire DIY section on Style File makes that evident enough. From sequinned wrist wraps to ombre nails with a glittery finish, there's a thrill about crafting something from scratch. It's also a wonderful way to be thrifty, upcycle and add personalisation rather than pick a generic store bought item. So when I learned from Hidesign about the Art of Reuse project that they hold annually, the DIYer in me was gung-ho to dive into it. The concept of the project is to reuse materials provided in a kit to create a complete product for your icon; something similar to the wealth from waste projects we did as school children. To get everyone fired up, it's also a contest and participation is completely free. Once you register yourself and pick up your kit from a Hidesign store or purchase it directly from Amazon for Rs.10, you will receive these items inside. 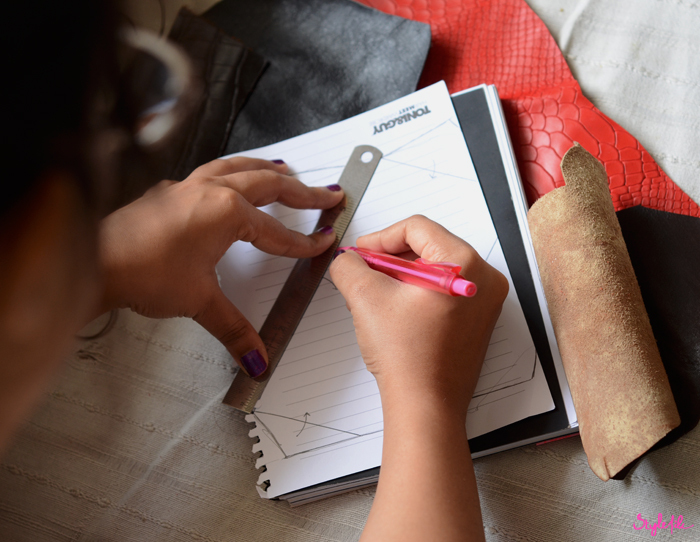 The leather scraps and waxed threads are remnants from Hidesign who craft leather bags and luggage, which I think is a great initiative. 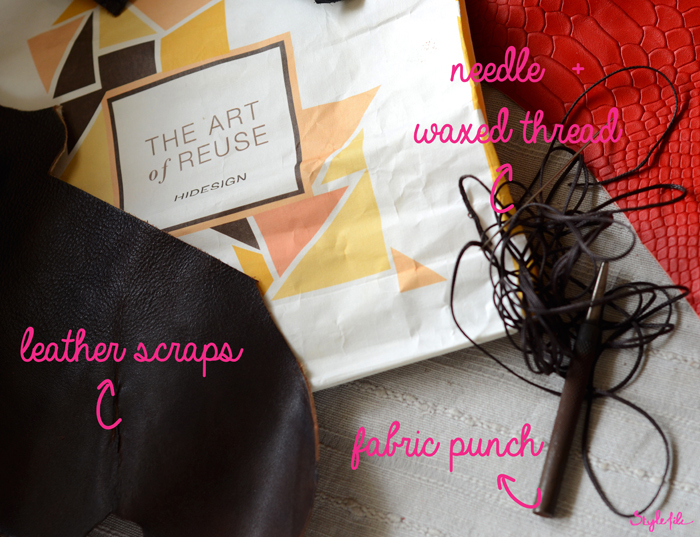 When I first saw the unshapely scraps and the slightly intimidating fabric punch, I was in disbelief if it would even be possible to create something of all this but after slowly taking my time to figure out what I wanted to do with it, it was actually quite enjoyable. 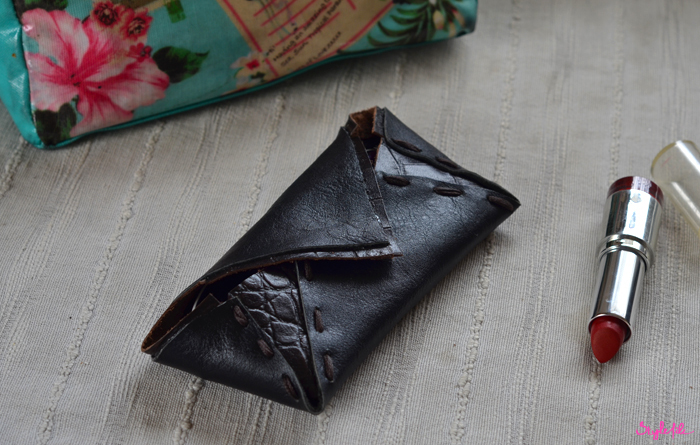 Since the scraps were unevenly shaped, I figured that I could probably get a sunglasses case from a single large scrap. To start off, I sketched a rough diagram of what I had in mind. Maths having never been my strong suit, I threw caution to the wind and winged it in terms of measurements. 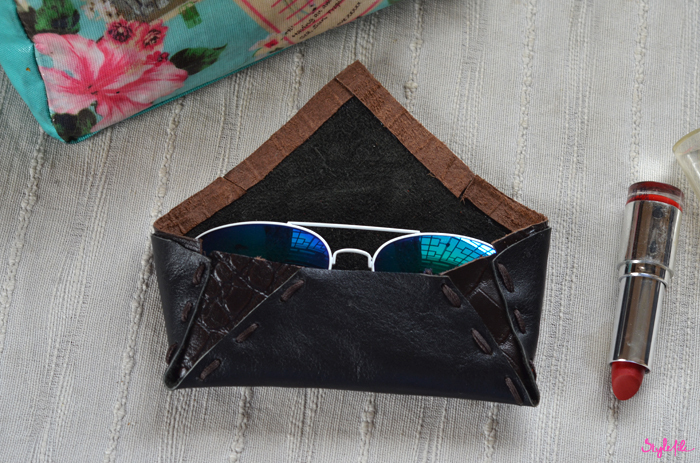 Somewhere down the line when fitting my sunglasses into the roughly shaped draft, I realised that triangular panels of crocodile embossed leather would add a smidgen of sophistication and to my luck, I had just enough of the embossed leather! 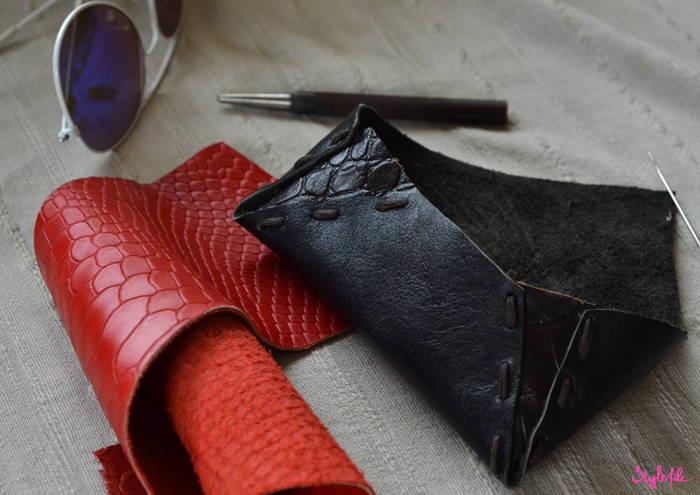 To sew the two leather panels to each other is the point when the fabric punch came in. Before using it, make sure you place a hard surface such as wood or stone below your fabric. Then position your punch, pointed side just above where you want a hole in the fabric. Hold it steady and using a hammer, hammer the flat side of the punch till you get a nice, even hole. This being my first time using the tool, I was slightly nervous but using it but slowly and steadily does the trick. Measure the area you need to punch holes into for your stitches and carry on doing so in the same manner. I've spoken previously about how essential fabric glue is to any DIY kit, so using it to glue the edge of the flap and strips of the embossed leather, I created a trim that would match the panels and bring the whole case together. 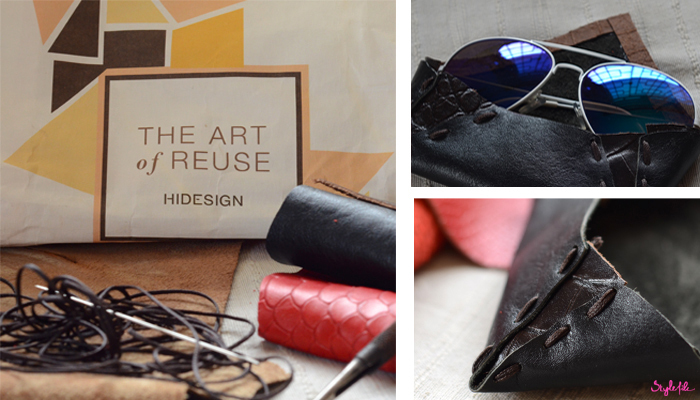 So there you have it - a complete look at how I handmade a sunglasses case for the Hidesign Art of Reuse project. Make sure you participate and submit your entry for the contest which is open till 31st of July. Not only is it a fun project and a great initiative to reduce waste, you might just win some wonderful prizes which includes a trip to Pondicherry and designing your own Hidesign bag!